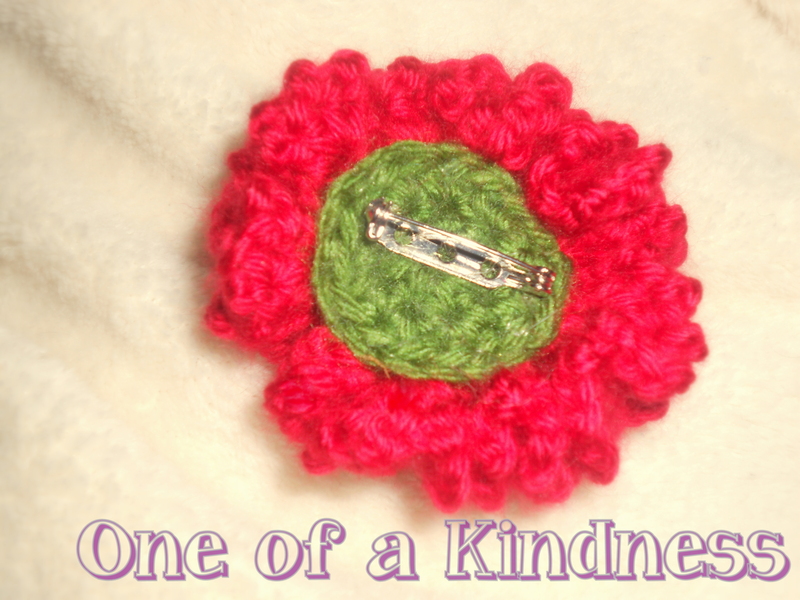 I’m making crochet carnation pins for Mother’s Day. The traditional options are red, pink, & white. 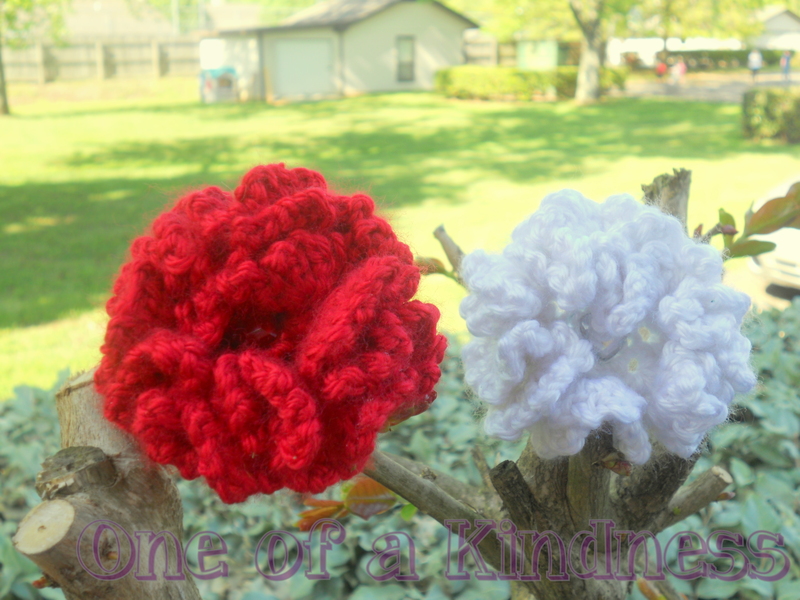 Red & pink if your mother is still living, & white if she is deceased. 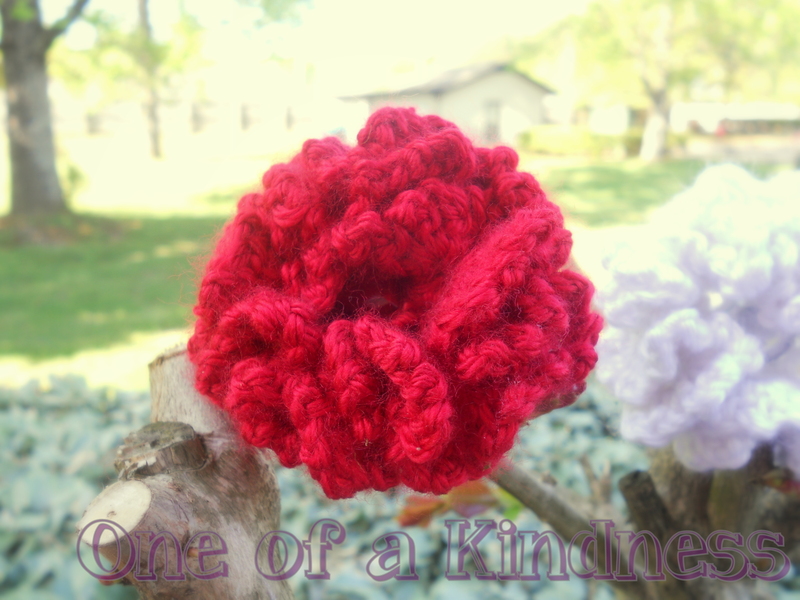 They are approx 2.5″ wide with pin backs, & each one has a heart in the center. They are $9, plus $3 to ship in the US. I can also ship internationally. Email my gmail.com address – OneofaKindness – to order. 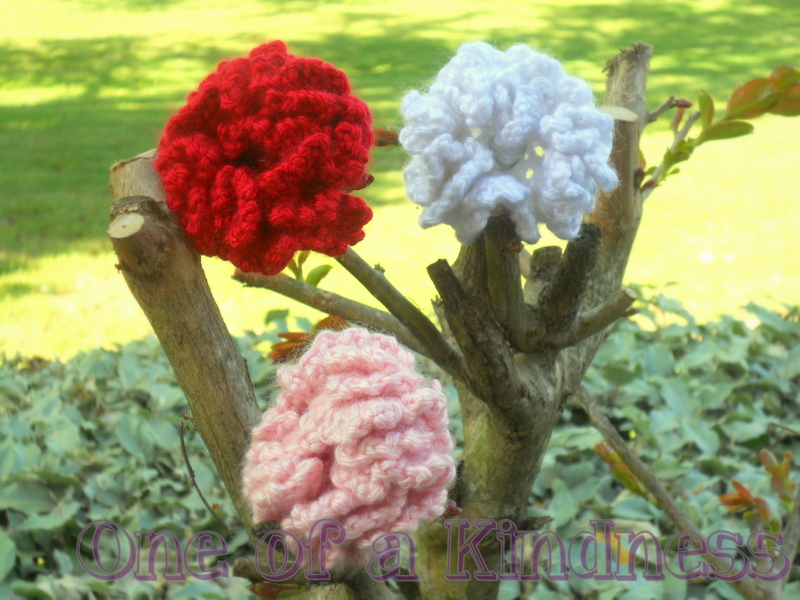 It would be super if you used the subject “carnation pins” so it’s easier to keep track of the orders. Thanks! 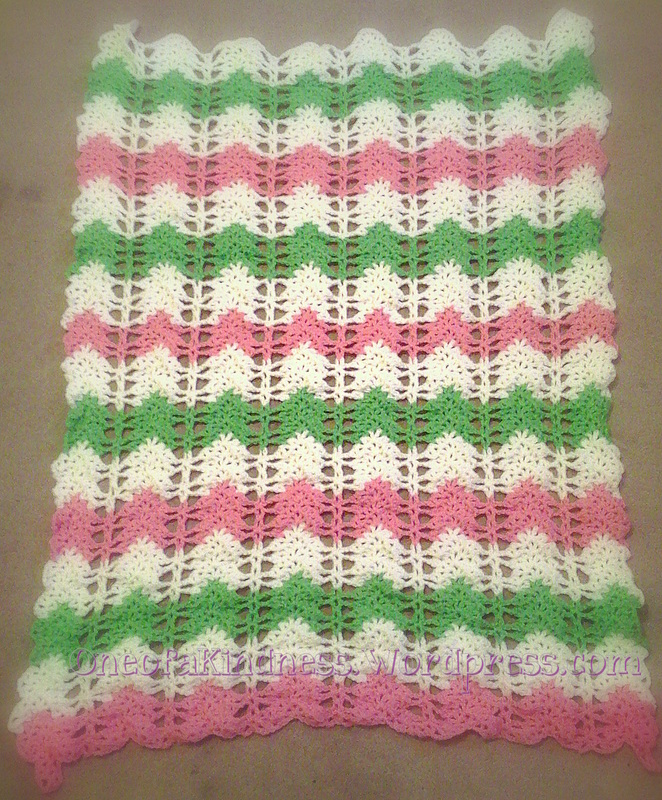 Normally I go with a large granny-square for baby afghans, but decided to break out & try a ripple. I had this pinned, so it serves to both make a lovely gift & prove that people actually do something with the things they pin! 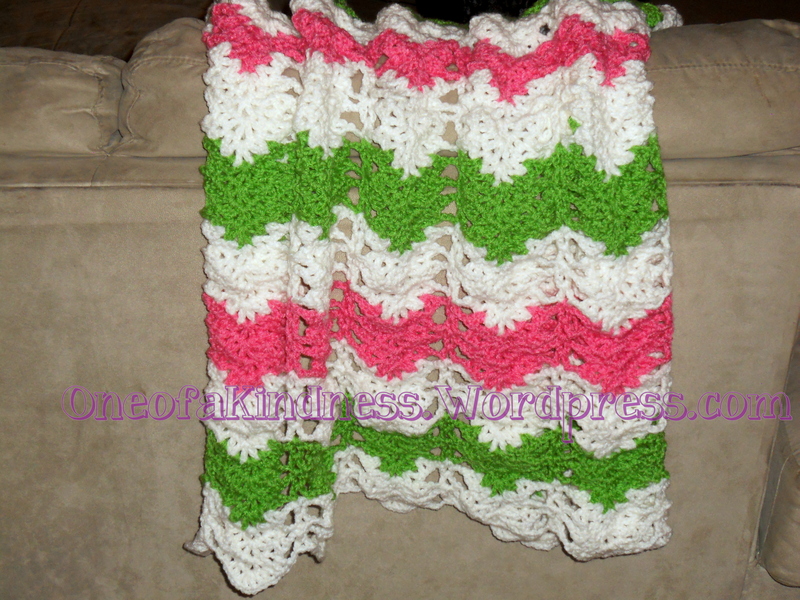 The yarns I used are all Red Heart Super Saver: perfect pink, soft white, & spring green. 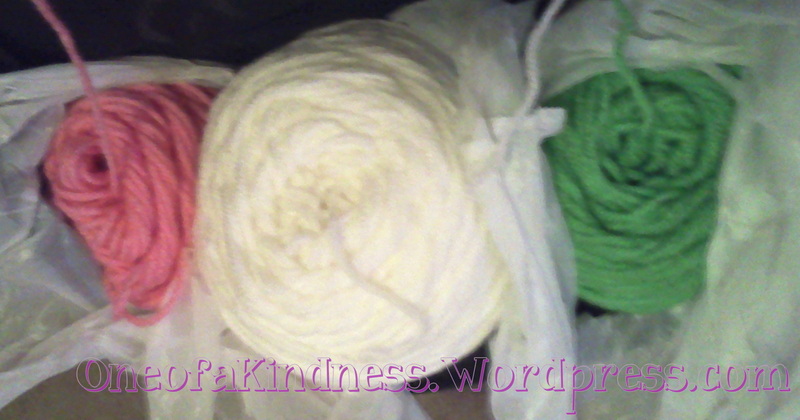 I found it odd that each color had a different level of softness, even though they are the same yarn. The green was the softest & the white was the stiffest. That leaves pink floating somewhere in the middle, closer to green than white. All in all, I was very pleased with my yarn choices. I’m going to wash it before shipping it off, so it should be even softer. I like a lot of pics when I’m looking at a pattern, so I have included a few more of mine behind the cut. 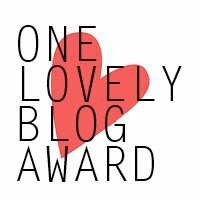 I decided for April I am going to blog every day, so here I am! To that end, I went through my photos & found some things I haven’t blogged about. These are some of the things I’m going to cover this month. Most of this pics were not meant for blogging, so excuse the crappy pics. 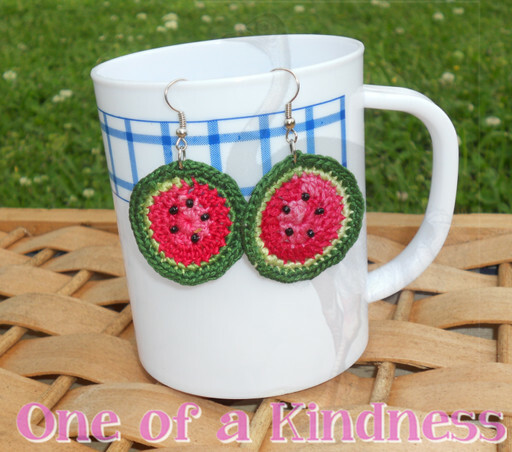 100% cotton crochet in a fun layering of pink & greens, with small black “seed” beads. A selection of backings is available. Don’t forget about the drawing going on this week on my Facebook page! 1. A pair of custom earrings from my shop. 2. A t-shirt designed just for this contest. 3. One of my triple headbands with braided ties in your choice of up to three colors. 4. 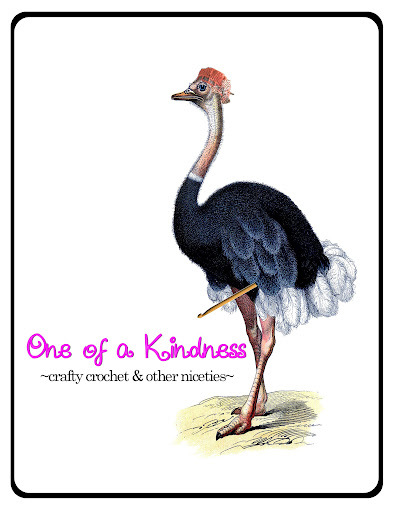 … & a $10 gift certificate to my shop (& only MY SHOP. Etsy is very clear that I must make it very clear to you my gift certificates are only good at my shop. So don’t try to use them at the liquor store. It won’t work). There will also be other random trinkets & candies, of the non-melty variety of course. It’s in the 90s here, so I won’t be sending out ice cream & chocolates. Also, I will be drawing for two $5 gift certificates with custom triple headbands. * In the event one of my male fans wins, alternative prizes can be arranged. The same goes for people who don’t wear pierced jewelry for religious reasons, or the like. I want you to have something you can enjoy! 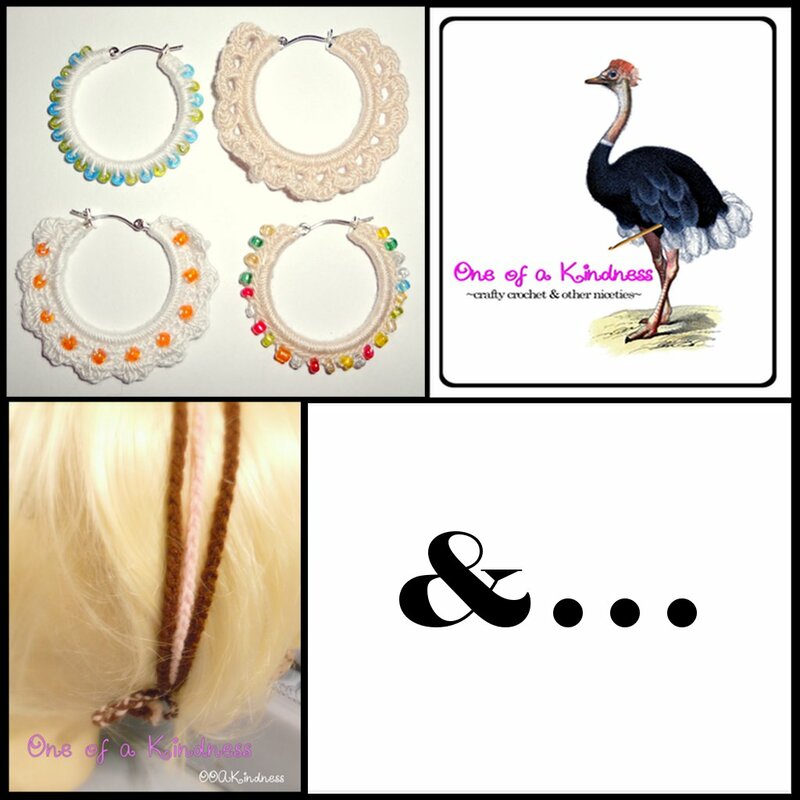 The earrings purchased will be made to order so some changes can be requested. When I saw these on Millie’s blog, millieonherworld, I knew I had to share them. They are so adorable! She based them on her & her boyfriend, Chris. There isn’t a tutorial, but she does talk a bit about her process & shows the wire “skeleton” she made for them so they are poseable. 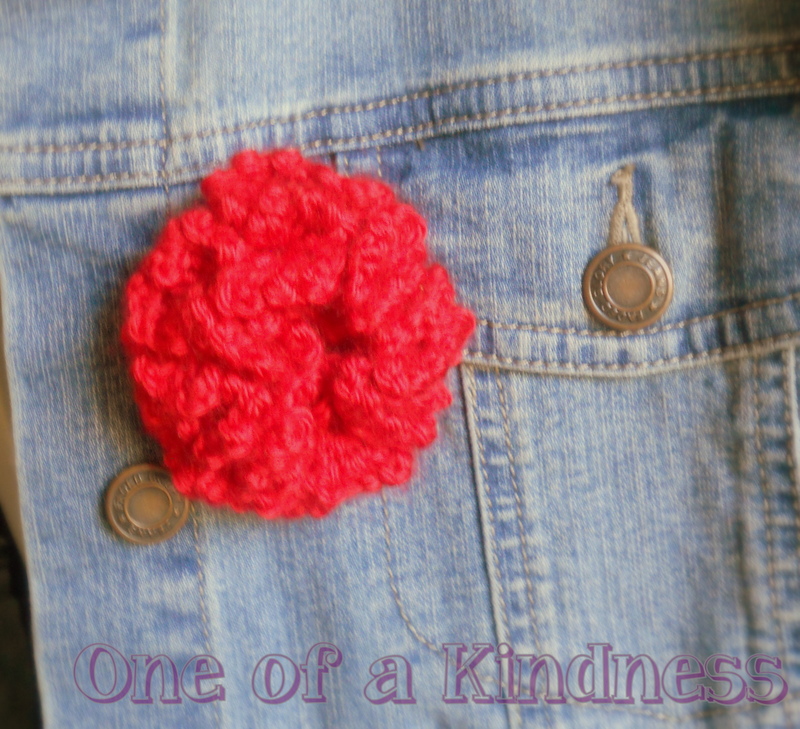 I also recommend checking our her tutorial for a felt cupcake wallet, & her site in general. 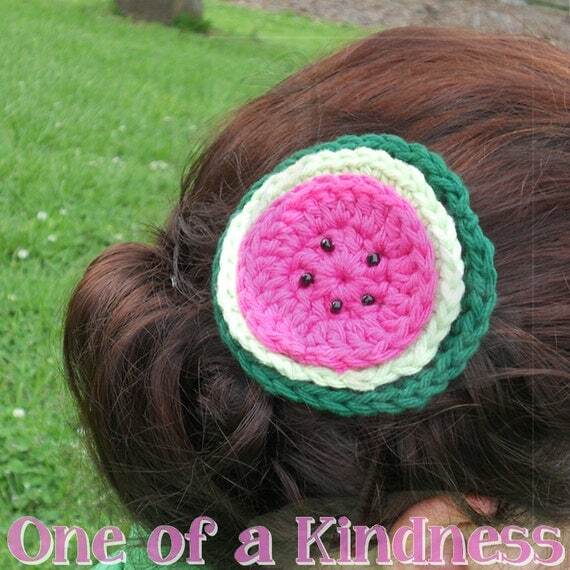 She does felt & crochet, including a crochet cupcake dress (yes, she has a thing for cupcakes). A friend’s son & his wife are expecting their first child together. 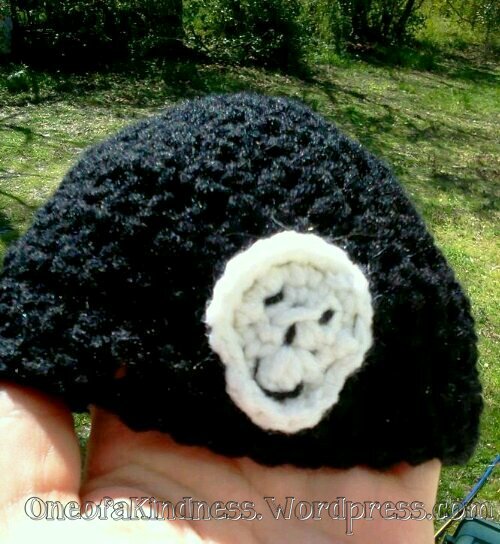 They are a young couple whose tastes don’t lend themselves to typical baby attire, so I decided to make a hat they would be proud for their baby to wear. I made this for Christmas, but have seen something similar made with red hots so that would make a nice Valentine’s Day variation. 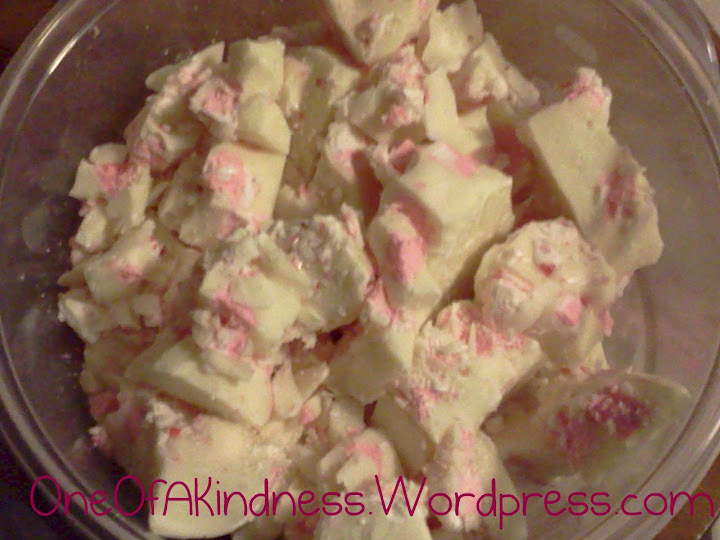 It was very popular & most commonly described as “pure sugar”. It’s like a tastier version of rocket fuel!